Small-conductance Ca2+-activated K+ channels (SK channels) are independent of voltage and gated solely by intracellular Ca2+. These membrane channels are heteromeric complexes that comprise pore-forming alpha-subunits and the Ca2+-binding protein calmodulin (CaM) (PUBMED:11323678). CaM binds to the SK channel through this the CaM-binding domain (CaMBD), which is located in an intracellular region of the alpha-subunit immediately carboxy-terminal to the pore. Channel opening is triggered when Ca2+ binds the EF hands in the N-lobe of CaM. 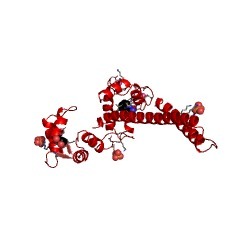 The structure of this domain complexed with CaM is known (PUBMED:11323678). This domain forms an elongated dimer with a CaM molecule bound at each end; each CaM wraps around three alpha-helices, two from one CaMBD subunit and one from the other. Small-conductance Ca2+-activated K+ channels (SK channels) are independent of voltage and gated solely by intracellular Ca2+. These membrane channels are heteromeric complexes that comprise pore-forming alpha-subunits and the Ca2+-binding protein calmodulin (CaM) [(PUBMED:11323678)]. CaM binds to the SK channel through this the CaM-binding domain (CaMBD), which is located in an intracellular region of the alpha-subunit immediately carboxy-terminal to the pore. Channel opening is triggered when Ca2+ binds the EF hands in the N-lobe of CaM. The structure of this domain complexed with CaM is known [(PUBMED:11323678)]. 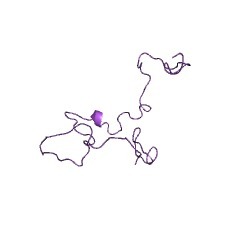 This domain forms an elongated dimer with a CaM molecule bound at each end; each CaM wraps around three alpha-helices, two from one CaMBD subunit and one from the other. There are 1789 CaMBD domains in 1786 proteins in SMART's nrdb database. Taxonomic distribution of proteins containing CaMBD domain. This tree includes only several representative species. The complete taxonomic breakdown of all proteins with CaMBD domain is also avaliable. Click on the protein counts, or double click on taxonomic names to display all proteins containing CaMBD domain in the selected taxonomic class. 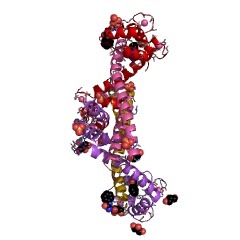 Structure of the gating domain of a Ca2+-activated K+ channel complexedwith Ca2+/calmodulin. Small-conductance Ca2+-activated K+ channels (SK channels) are independentof voltage and gated solely by intracellular Ca2+. These membrane channelsare heteromeric complexes that comprise pore-forming alpha-subunits andthe Ca2+-binding protein calmodulin (CaM). CaM binds to the SK channelthrough the CaM-binding domain (CaMBD), which is located in anintracellular region of the alpha-subunit immediately carboxy-terminal tothe pore. Channel opening is triggered when Ca2+ binds the EF hands in theN-lobe of CaM. Here we report the 1.60 A crystal structure of the SKchannel CaMBD/Ca2+/CaM complex. The CaMBD forms an elongated dimer with aCaM molecule bound at each end; each CaM wraps around three alpha-helices,two from one CaMBD subunit and one from the other. As only the CaM N-lobehas bound Ca2+, the structure provides a view of both calcium-dependentand -independent CaM/protein interactions. 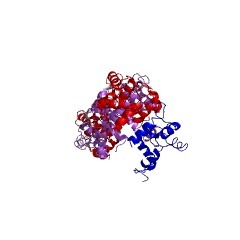 Together with biochemical data,the structure suggests a possible gating mechanism for the SK channel.